Bangladesh army deployed around the Pilkhana on February 25, 2009. Photo: Zahedul I Khan. Exactly two years have passed since the barbaric killings of the infamous BDR mutiny. 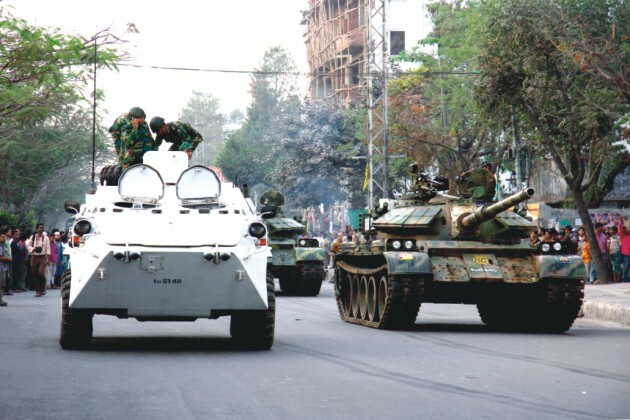 On 25 February, 2009, Dhaka woke to the sounds of gunfire and artillery shells and the news that a group of mutinous BDR personnel was holding army officers and their families hostage inside the BDR headquarters at Pilkhana. The mutiny lasted for almost 33 hours and resulted in the slaughter of 57 army officers. The mutineers looted and plundered at will during the mutiny. At least six civilians also died as a result of the mutiny. In the past, the BDR had played a valiant role in the country's war of liberation, it has performed courageous actions to safeguard the country's borders against overwhelming odds against more powerful and mostly unfriendly forces of a neighbouring country and have won the respect and admiration of the general populace as a whole. So, the gruesome killings in Pilkhana not only shocked but also confused the nation. 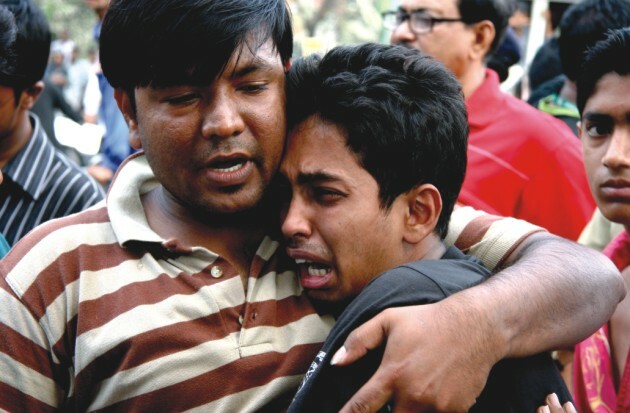 A young man grieves for his father murdered inside the BDR headquarters. Photo: Zahedul I Khan. Following the mutiny in the BDR headquarters at Pilkhana, the once vaunted BDR was bound to lose its effectiveness, whether it came to prevent smuggling or assist in anti-terrorist operations. To make matters worse, the mutiny of Pilkhana had spread to some degree to other parts of the country, though there were no killings. The creation of a new force became inevitable. On January 23, 2011, the Border Guards Bangladesh (BGB) officially started its journey. 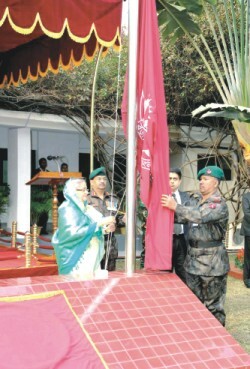 After the Prime Minister hoisted the new BGB flag, the staff of the force inaugurated the plaque of Bangladesh Border Guard Sadar Daptar (Headquarters), which replaced the 39-year-old nameplate of "Bangladesh Rifles Sadar Daptar" atop the main building at Pilkhana. But whether the BGB, a force which had started its journey out of the ashes of the demoralised BDR, would be able to regain the former efficiency of the force is still to be seen. According to security analyst Major General (retd) Amin Ahmed Chowdhury, for the new force to function well, those involved in the mutiny should be dealt with severely and they should not have any place in the force anymore. He says that it is in the interest of the nation that those involved be given exemplary punishment. Dr Imtiaz Ahmed, Professor of International Relations, University of Dhaka also emphasises on the threat of 'very influential smugglers' operating on the Indian borders. He says, “BGB has to earn the trust of the nation through their efficiency especially in the border zone.” He says the black market on the borders with India is at least 3.5 billion dollars and the BGB has to compete and launch operations against them. “This is not my own figure, even Indian economists will agree,” he says. “India does not have a bigger border with any other country, not even with China,” he says. “So India is desperate to push their goods in the Bangladeshi market,” says Dr Ahmed. “India is erecting a fence on their borders but still the smuggling of goods into Bangladesh has remained the same.” He goes on to say that since the fence has been erected on Indian borders, and as the BSF is firmly entrenched behind the lines, without the consent of the BSF, it is impossible for such smuggling activities to go on. Under such circumstances, the BGB will face a mammoth task and they must perform their duties with utmost efficiency. Commenting on whether old BDR jawans should be retained in the new force, Major General (retd) Chowdhury says that in all countries, when there are mutinies, those involved are thrown out of the force. "The death sentence is not mandatory for everyone, but they have to be thrown out," he says. "The scale of crimes committed by the mutineers has to be determined, and accordingly punishment should be meted out to them." Chowdhury suggests that those innocent of the mutiny have to be given an orientation programme. "Following the mutiny, BDR personnel have become demoralised, dejected and humiliated. So the old members who are totally innocent of mutinous acts have to be given an orientation course, so that they are free of these negative feelings. They have to be shown that the state still has confidence in them. Only then can they perform their duties." But he suggests that only those who are completely innocent should be allowed to continue their services in the force. "Those soldiers in the force who are promoted to the ranks of DAD have to be given the training of Bangladeshi army officers at the military training institute. That shall not only enhance their capabilities as officers and increase their sense of responsibility as soldiers, but will also improve relationships between the paramilitary force and the regular army." "Following the mutiny, officers in command of BDR performed their duties with courage. But the real reasons behind the mutiny still remain unclear and the motive for the killing of these officers are still not known to us," he says. As BGB starts their journey, it is going to face challenges against overwhelming odds similar to its predecessors in the BDR. With the shadow of the Pilkhana tragedy looming over the whole nation, the job is all the more difficult. Meanwhile, the masterminds behind organising the massacre in Pilkhana are yet to be brought to book.